Furmint van Tornai uit Somlo, Hongarije. Een groengele wijn uit één der kleinste wijnregio’s van Hongarije. Een wijn met een hoge mineraliteit, ‘crispy’ zuren en zeer droog. Typical Furmint on the nose, while the style is very new, modern. Minerality is mixed with the freshness of pear and peach. Very rich on the palate, flavorsome, full of tropical fruit, varietal character and the typicity of the Somló mountain. Floral and a touch of minerality leading the finish, very fine and elegant with exciting acidity. 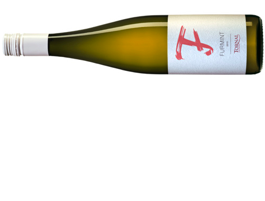 With this Furmint we show a new face of the variety, a truly stylish wine. Serious but at the same time this fruity side can be very much appreciated as well. The fresh acidity became rounder, thus a very exciting and valuable wine was created yet it’s still easy to enjoy.